It was on his Friday, April 1, program, but it was no joke. 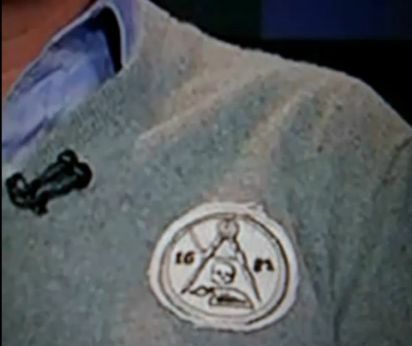 Glenn Beck, who has announced he will leave Fox News, was blatantly wearing a masonic emblem over his grey sweater, quite a conspicuous clothing accessory. Why would Beck choose this apparel? Is it an obscure reference to colonial founders or a tip-off that his allegiances lie with the secret society-elites who have long wielded power? Beck wears the emblem during his broadcast, while hyping Islamophobia and wider mid-east war. Glenn Beck has previously been seen sporting a Skull & Bones cummerbund, also a masonic symbol. It is little different than Arnold Schwarzenegger, David de Rothschild and many others wearing such symbols while posing for magazines or other media– an act of flaunting their inclusion in elite circles and secret societies over the ignorant public who are not meant to understand.